Jos. 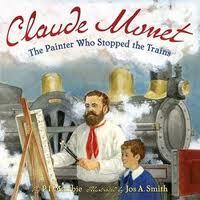 A. Smith illustrates this book with beautiful watercolor paintings of the artist Claude Monet and his world. The characters are surrounded by gorgeous landscapes and rendered in colorful period clothing, their faces brimming with personality (the rotund Monsieur le Director is my favorite). The only disappointment is the lack of actual Monet paintings. The author’s note has only two very small reproductions of Monet's work and just one is from the Gare Saint-Lazare series which is the focus of this book. 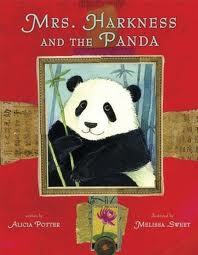 This story is great, but must be read in conjunction with a quality art book of Monet’s paintings. Not lovin’ the cover of this book: it’s too pink, the illustrators chose a particularly unfortunate hairstyle and untrimmed beard for Henson, and I won’t mention the shirt, which, yes, was probably hip at some point in the 1960s. What is really disappointing is that painters Steve Johnson and Lou Fancher don’t manage to capture the sparkle of creativity and delight in the eye of Jim Henson that is so apparent in photographs and film of the man who created the wonderful Muppets. Krull’s text is about as uninspired as the illustrations. The composition offers nothing lyrical or creative and the vocabulary is banal. Though lacking style, the content does offer some nice information about the beginnings of Sesame Street. 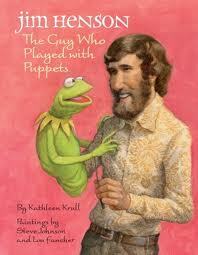 There are a number of Henson biographies for children at the public library. This may not be the one to pick. An exciting adventure story, this book follows Jane Goodall from her early childhood years as an observer of nature to her years in the African forests of Gombe, Tanzania where she began a lifelong mission to observe and protect chimpanzees. 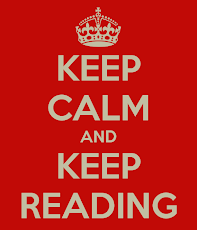 Winter’s text is simple and sustains reader interest throughout the book. Her folk art inspired illustrations keep youngsters looking closely to try to spot the cleverly hidden chimps while a determined Jane waits and looks. This book avoids the mere recitation of facts, which is a common trap of nonfiction. 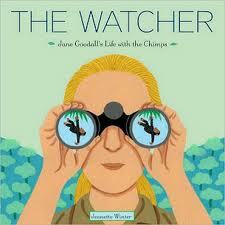 Instead, it fills the senses with Goodall’s story. In 1934, Ruth Harkness was thought to be too dainty to carry on her husband’s exploration of China in search of the elusive panda bear – after all, she was only a New York City housewife and designer of tea gowns. The fascinating and little-known story of her journey is lovingly told by Alicia Potter and illustrated to perfection in travelogue style by Melissa Sweet. Sweet arranges maps, packing lists, post cards, coins and bits of Chinese paper with her watercolor paintings. Her collages connect readers to the expedition and help express the bewilderment and fascination Harkness may have felt in traveling to the rugged, beautiful mountains of faraway China. This is a delightful book. Honestly, I don’t know who would read this particular book. 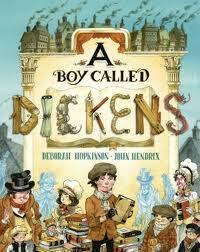 After all, Charles Dickens’ novels are a bit too difficult to be appreciated by the picture-book crowd. And those middle readers and teens mature enough to read Dickens are not likely to be interested in a biography aimed at the four-to-nine age group. Nevertheless, I like the narrative voice; the story of the novelist’s childhood is well told and interesting. The illustrator, John Hendrix, is familiar to readers of this column for his book about John Brown. He brings similar energy to this story. The backgrounds and scenery are well rendered, but the characters have an odd sort of Mad magazine quality to them. 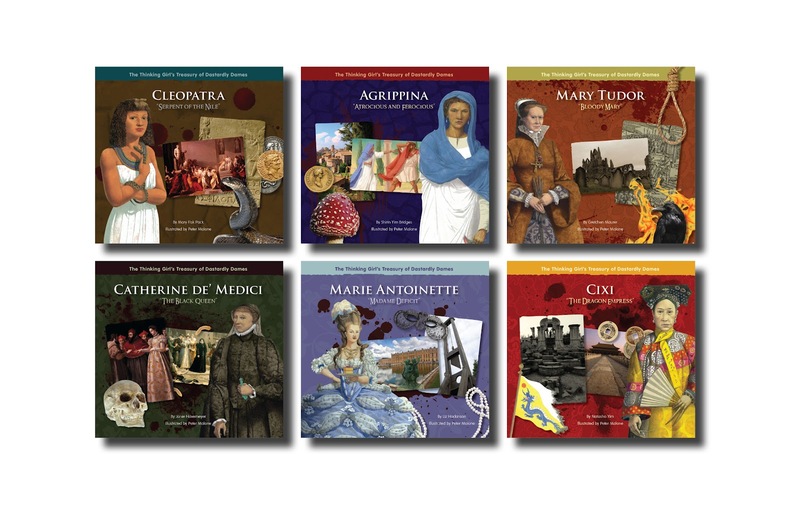 This series profiles six powerful women, from ancient Rome to twentieth-century China – women who earned nicknames such as “Bloody Mary,” and “The Maggot from Italy’s Tomb.” Some, like Cleopatra, are well known, while others, like Cixi, will be new to many young readers. The crimes and misdeeds of these six are legendary. But does a legend tell the whole story? Giving the series an enticingly distinctive look, Peter Malone illustrates Marie Antoinette, Agrippina, and the rest, as fashionable and forbidding. Malone uses dark, textured backgrounds to set an ominous mood and to animate photographs and artifacts so that they appear to pop off the page. Mixed in with each woman’s story are lessons in art history, geography, culture, fashion and numismatics. 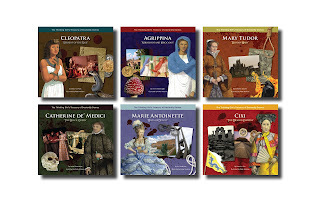 Your child's history textbook doesn't look this good! This is an appealing series aimed at the 9-13 age group. M. D. Clark hopes her biographer will be kind.